Showcasing Crossref Event Data and the importance of understanding what lies beneath the data. Some things in life are better left a mystery. There is an argument for opaqueness when the act of full disclosure only limits your level of enjoyment: in my case, I need a complete lack of transparency to enjoy both chicken nuggets and David Lynch films. And that works for me. But metrics are not nuggets. Because in order to consume them, you really need to know how they’re made. Knowing the provenance of data, along with the context with which it was derived, provides everyone with the best chance of creating indicators which are fit for purpose. This is just one of the reasons why we built the Event Data infrastructure with transparency in mind. For the scholarly community, alternative metrics to citation count (‘altmetrics’) are becoming increasingly popular as they can offer rich and expedited insight into today’s diverse and dynamic research environment. Research artifacts undergo an extended life online as they’re linked, shared, saved and discussed in forums both within and beyond the traditional academic ecosystem. Data on these interactions are initially fragmented and buried within platforms like social media, blogs and news sites. Downstream, there are several value-add services that collate and present that data as a single, aggregated count. We see individual data points like ‘paper X was tweeted 22 times’, and ‘paper X is referenced 16 times on Wikipedia’ being combined, homogenised, weighted and expressed as a single figure, a calculated number serving as a proxy for value. But altmetrics alone don't tell the whole story, and how they are calculated is not without idiosyncrasy or politics. As we each have our own unique voice and perspective, we need to ensure we understand the lenses through which these metrics are made in order to consume them effectively. The 2015 Metric Tide report highlighted transparency as one of the five dimensions of responsible metrics. Having access to the context used to create a metric — the provenance of the original data as well as full transparency around its extraction, processing and aggregation — helps consumers to use the data meaningfully and allows for comparison across third-party vendors. But transparency is difficult to achieve when, as the report notes, the systems and infrastructure for collecting and curating altmetrics-style data are fragmented and have limited interoperability. In the academic community, underlying centralised systems include ORCIDs to identify people and DOIs to identify items. But we’re missing a transparent, centralised infrastructure for describing and recording the relationships between objects and resources. These relationships, or links, occur outside publisher platforms and can provide valuable information about the interconnectivity and dissemination of research. Dedicated infrastructure for collecting these relationships would provide a data source for those interested in altmetrics to build upon. 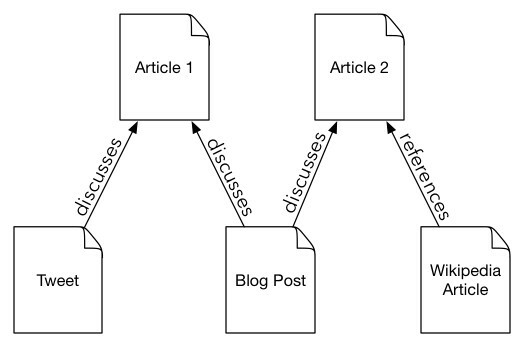 Example of some relationships between articles and activity on the web. Crossref (CC0). In collaboration with DataCite, we are collecting Events for the DOIs registered with our organisations and are making that data available for others in the community to use. This is the Event Data infrastructure, with which we’re plugging the gap in open scholarly relationships infrastructure. Querying for individual DOIs wasn’t scalable for our full corpus of 100 million items, so we had to find something else. Not everyone uses the DOI link (not a surprise!). Most people will link directly to the publisher’s site. 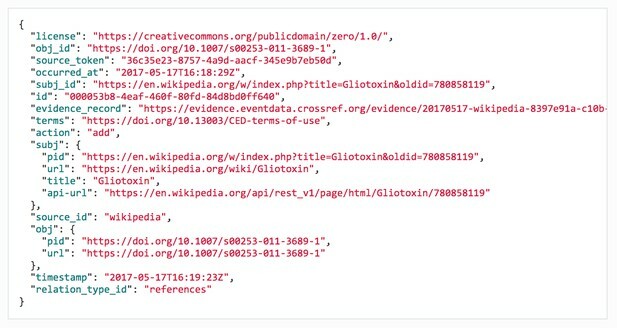 This means we need to look for links using both the DOI and article landing page URLs. We don’t always know the article landing page URL for every DOI upfront because like many relationships, the one between DOIs and URLs is complicated. Ultimately this has allowed us to represent actions like Wikipedia page edits as individual atomic actions (i.e an Event) rather than as a dataset that changes over time. A Wikipedia Event. Crossref (CC0). We’re collecting data from a diverse range of platforms including Twitter, Wikipedia, blogs and news sites, Reddit, StackExchange, Wordpress.com and Hypothes.is. This means that when we observe a link in these platforms to what we think is a DOI, we create an Event and a corresponding Evidence Record to represent our observation. We also have Events to represent the links between research items registered with Crossref and DataCite – for example, when a Crossref DOI deposit cites a DataCite DOI and vice versa. The provenance of the data is fully transparent and is made available to everyone via an open API. We call this the evidence trail. The record of each link (‘Events’) as well as the corresponding evidence can then be used to feed into tools for impact measurement, discoverability, collaboration and network analysis. The National Information Standards Organisation (NISO), a US organisation responsible for technical standards for publishing, bibliographic and library applications, has developed a set of recommendations for transparency in their Alternative Assessment Metrics Project report, as well as a Code of Conduct for both altmetric practitioners and aggregators that aims to help improve the quality of altmetrics data. The working groups recognised that without transparency and conforming to a recognised standard, altmetric indicators “are difficult to assess, and thus may be seen as less reliable for purposes of measuring influence or evaluation”. 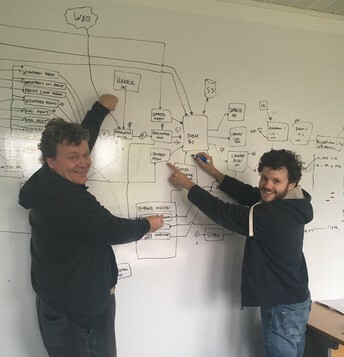 Martin Fenner (DataCite) and Joe Wass (Crossref) drawing plans for the Event Data infrastructure. Because Crossref Event Data is completely open data, we believe it's a game-changer for altmetrics. Our latest project, Paperbuzz.org, is just the first of a whole constellation of upcoming tools that will add value on top of Crossref's open data. We are working towards launching Crossref Event Data as a production service. In the meantime though, please do take a look at our comprehensive User Guide. Hopefully you’ll be inspired to go make something cool using the data! Events are being collected constantly; take a look below as they stream in from our data sources or visit our live stream demo site to watch in real time. Screen capture of Crossref Event Data live stream demo. As the service matures, we’ll continue to add new platforms to track and I also encourage anyone with article link data to get in touch to discuss how we can share it with the community via Event Data. For researchers in particular, I’m really keen to hear your thoughts on our data model and about the things we could additionally provide you with from an infrastructure perspective that would best support your research needs. And if you’re a publisher, take a look at our Event Data best practice guidelines — there’s some really important information in there about how you can help give us the best chance possible of collecting Events for your registered content. And finally, if you’re a consumer of altmetrics data, I encourage you to ask questions. Ask your altmetrics vendors about how they gather their data and what context they apply to the aggregation of the metrics they supply. Ask yourself what behaviours you are interested in tracking and equally those you are not. Think about the endgame; about the type of impact you’re truly trying to measure and the story you want to tell. Because it’s these questions that will help you choose indicators that are the best fit for your own unique narrative. This content is cross-posted on Crossref’s blog.